Prior to beginning the Rendering process, you should familiarize yourself with the screen layouts of the various menus. Many functions can be selected using the Renderer control panel or by selecting the appropriate command from the Pull-Down Menus. The Renderer Control Panel is used to adjust the 3D model display parameters. Open Sequences - Displays a list of the active models. Animation Speed Slider - The speed/duration slider allows the user to control the speed of the animation. Rendering Options - Selected to examine or modify the properties of the active model. Properties include segment type, rendering options, colors and translating options. Scene Duration - The amount of time for the model to be displayed from the first to the last image. Rotation Speed Slider - The rotation speed slider allows the user to adjust the rate of the scene rotation. Current Position Slider - The position slider allows the user to go to any position (time really) in the animation. Current Position - Displays the current position in percentage of the entire sequence. Orientation Slider - The orientation slider allows the user to rotate the model about the Y (vertical) axis of the global coordinate system. Reset - The reset button is selected to remove all orientations performed by the mouse. Once the Java plug-ins have been successfully installed, the Renderer program is started by double-clicking on the 3D-Render icon located in the APAS System folder. This will open the main 3D Renderer window. The following steps are recommended for correct operation of the Renderer program. Select the OPEN command from the FILE menu. The OPEN File Dialog box will appear. The OPEN File Dialog box looks for a particular type of file (files that have the extension of (*.3D). This file is automatically created when a Sequence file is transformed using the ARIEL TRANSFORMATION software module. The OPEN File Dialog box can be used to specify the Drive, Directory, and Name of the sequence file to be retrieved. Select the sequence name to be modeled and then select OPEN to proceed. When the desired sequence is opened, the rendered data figure will appear on the graphic display. Select the ADD ANOTHER command from the FILE menu to open additional sequences. R.FOOT, R.ANKLE, R.KNEE, R.HIP, L.HIP, L.KNEE, L.ANKLE, L.FOOT, R.WRIST, R.ELBOW, R.SHOULDER, L.SHOULDER, L.ELBOW, L.WRIST, CHIN, FOREHEAD. If any of the above points are missing, your data will be shown as cylinders. Future versions of this program may allow custom modelling. The properties for each model can be adjusted independently. User adjustable properties include segment selection, rendering options, segment and point colors, trace options and also the ability to translate the model on the graphic display. Properties are adjusted using the following steps. 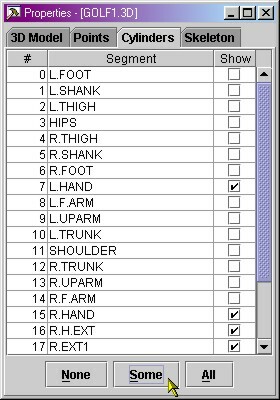 Select the desired model from the list of open sequences in the lower left corner of the control panel. Select the Properties button on the control panel. The Properties menu will be displayed in a new window. Select the 3D Model tab to display the current model properties. The name of the model will be displayed in the upper portion of the Property menu. Segment Rendering Options - Selected to display the model segments as either Bones or Cylinders. Rendering Options - Selected to display the segments as Solid, Wire Frame or Points Only. Segment/Point Color - Selected to change the color of the model segment/points. Segment/Point Size Slider - Used to adjust the size of the model segment/points. Position Sliders - Used to translate the model along the global coordinate system axes. This is often useful when multiple models are simultaneously displayed. The segment rendering options control the way the model is rendered. Choose from the given options (None, Cylinders only, Skeleton only, or Cylinders & Skeleton). This choice may enable or disable some of the other tabs. 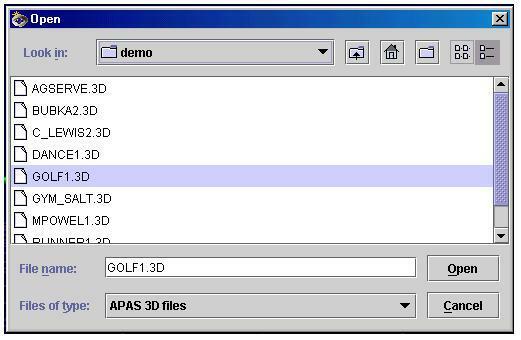 After opening the demo file GOLF1.3D, the default "Segment Rendering Options" will be set to "Cylinders only" ("Properties", see screen shot below). I made this choice only because of rendering speed (cylinders render faster than bones). Because "Cylinders only" has been selected, the "Skeleton Tab" is disabled (grayed). 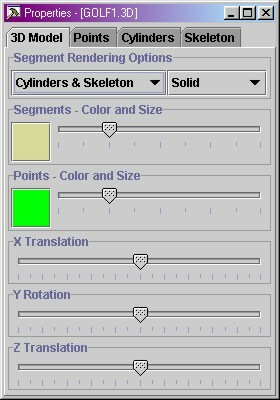 Change the "Segment Rendering Options" to "Cylinders and Skeleton". This allows you to see both cylinders AND bones. When doing this, the "Skeleton Tab" will be enabled too. In the "Points Tab" you can now indicate which points you want to see, and also which points you want to trace. This is to stress a certain point to the audience. 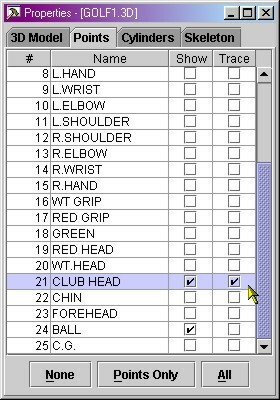 For example, click the "None" button below to disable everything, and then show the CLUB HEAD and BALL points. The other points really convey no additional information. You can use the sliders on the first tab to change the size of the segments (to what you like) or the balls (a soccer ball is bigger than a golf ball). On the Cylinders tab, you can select which cylinders are rendered. Choose NONE or ALL to deselect or select all cylinders at once. 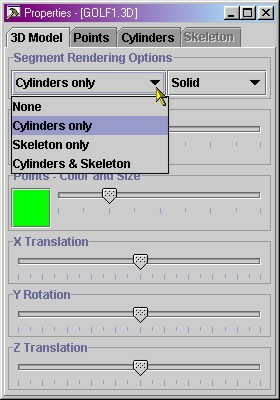 Or select SOME to only select those cylinders which are not contained in the skeleton (this option is only available when "Cylinders & Skeleton" has been chosen in the Segment Rendering Options. On the "Cylinders Tab" press the "Some" button. This will enable all cylinders that are not contained in the skeleton. You can disable and enable any cylinder you like here. Note that the cylinders grow and shrink if the segment length is not constant. In previous versions of the renderer, the segments became disconnected (not anymore). 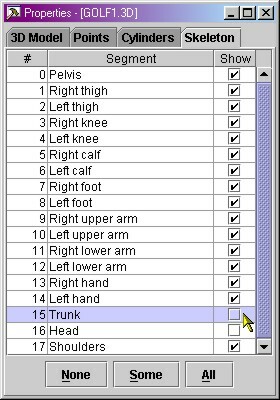 In the "Skeleton Tab" you can enable/disable any available segment of the skeleton. If you choose "Some" it will enable all bones, except for hands, trunk and head. Disabling the trunk and the head (and perhaps hands) will significantly improve rendering speed (especially the trunk has very complex geometry and takes extra time to render). 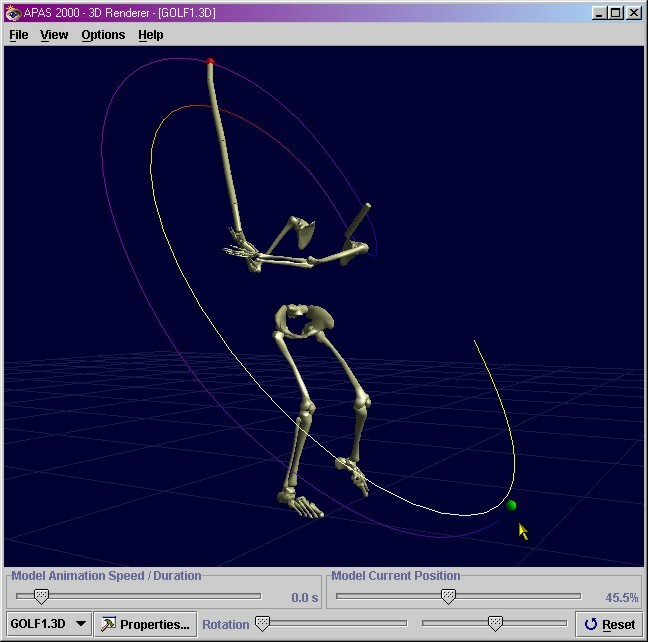 If you selected all the above options, the resulting golfer should look something like below. It's a good trade-off between rendering speed and a nice-looking model. Notice that it has a combination of certain points (club head and ball), certain traces (club head), certain cylinders (club and head) and certain bones (all except trunk and head). NOTE: Traces are displayed in multiple colors. These colors indicate relative velocity. Darker colors indicate slowest velocity while lighter colors indicate faster velocities. You can think of the scene as holding an object in your hands, for example a pen. When examining a pen you can turn it around in any orientation: you generally do not change your head orientation while examining a pen, but rather you rotate and translate the pen with your fingers to examine it. 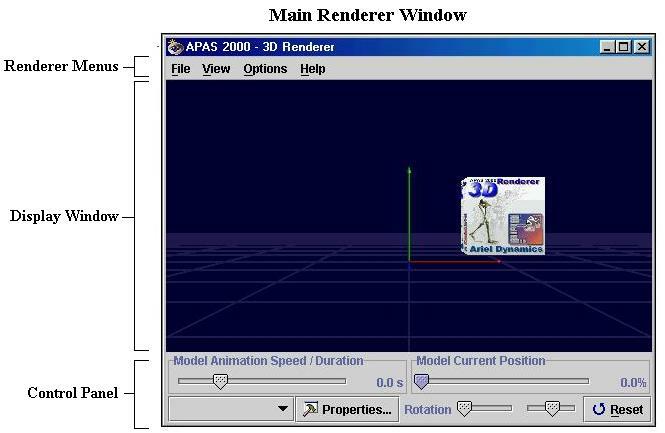 APAS 3D Renderer uses a similar mechanism to examine a scene. The 3D model scene can be rotated and/or translated using the options listed below. By default, the 3D model scene opens and displays the sequence in the XY plane (as defined by the control points in the APAS Digitizing module). The displayed orientation can be changed using the mouse or slider bars. Using the mouse you can change the location and orientation of the scene in a virtual universe. The Left mouse button will change the attitude or orientation of the scene: you can use it to rotate the scene. The Right mouse button will allow you to translate the scene in a plane parallel to the screen; use the right mouse button to move the entire scene to the left, right, down or up. The Middle mouse button (or Ctrl-Left) will translate the scene in a plane perpendicular to the screen; use this to get closer to an object of interest. The Orientation slider bar located in the control panel is used to orient the 3D model. The full range of the Orientation slider represents a 360 degree rotation about the Y (vertical) axis. Select the RESET button in the lower right corner of the Renderer window. This will reset all orientations performed using the mouse. You can control the speed and position of the animation by using the sliders at the bottom of the screen. The program will interpolate segments orientations between captured frames to get the most natural animation. The speed/duration slider allows you to control the speed of the animation. The position slider allows you to go to any position (time really) in the animation. The software uses interpolation between the different frames to achieve the smoothest possible animation on your hardware. An example: Suppose you play a 2-second sequence containing 100 frames, captured using a PAL system at 50 frames per second. When rendering this animation and setting the total length of the animation to 60 seconds, you would normally achieve a frame rate of about 100/60 = 1.67 frames per second. But 3D Renderer uses a different strategy: if your hardware allows you to achieve a full 50 frames per second, the software will automatically interpolate all segment orientations: it will calculate 60 * 50 = 3000 new orientations for each segment: this effect is immediately noticeable to the user. Instead of watching the animation play at a jerky 1.67 frames per second while wasting your system's CPU-time, you will be able to exploit your hardware to the fullest and examine your animations in super-slow-motion at a 50 frames per second frame rate. Select the Open command from the File menu. Select the Open command from the File menu for the first model. Select the Open Another command from the File menu for each additional model. Select the desired sequence from the list of active models. Select the Properties button from the control panel. Select the 3D Model tab to change the segment properties, segment types, colors, and translation. Select the Tracing Options to add/remove trajectory traces on selected points. Listed below are the various menus for the Renderer program. Select the desired menu to see a description of the available commands for each menu. Clear Scene - Selected to remove the current models from the display. 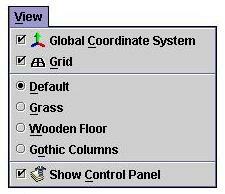 Global Coordinate System - Selected to toggle the display of the global coordinate system axes. By default, the red axis points in the positive X direction, the green axis points in the positive Y direction and the blue axis points in the positive Z axis. Grid - Selected to toggle the display of a grid pattern on the floor. Default - Selected to display the model against a dark blue background. Gothic Columns - Displays the model on a stone pattern floor with gothic columns. Show Control Panel - Selected to toggle the display of the control panel at the lower portion of the main Renderer window. Constrain Mouse Movements - if checked, the scene can only be rotated around its Y-axis. Many users find this easier to navigate. Uncheck it to allow free rotation of the scene in any direction. Properties - Selected to examine and/or modify the display options. Available options include the ability to set the segment display for using bones or cylinders These segments can be modeled using solid, wire frame or points only displays. Options are also available for translating individual figures to any desired location. Help - Selected to display the local help file. Help on the Web - Selected to access "on-line" help information. 3D Database on the Web - Selected to connect to the Ariel database file. About - Provides information about the Renderer program.